The Moultonborough Community has made water quality protection a high priority, investing considerable resources over the past five years to address milfoil and lake quality. Located in the Towns of Moultonborough and Sandwich in Carroll County, New Hampshire, Moultonborough Bay Inlet (MBI) serves as an attractive summer getaway for tourists who come to enjoy the scenic beauty and good water clarity of MBI and Lake Winnipesaukee. Lakes are highly valued natural resources that provide critical habitat for a diverse abundance of plants, wildlife, and aquatic life, and opportunities for recreation, scenic enjoyment, and drinking water. Because the water quality of lakes and streams can decline rapidly because of stormwater runoff from watershed development, taking proactive steps to properly manage and treat stormwater runoff to protect these important water resources is essential for continued ecosystem health, including resources valued by humans. The MBI Watershed Restoration Plan is the culmination of a major effort by many individuals who not only care about the long-term protection of water quality in this waterbody, but also recognize that high water quality is directly connected to the economic well-being of the area. Lake Winnipesaukee Association (LWA) is the region’s leader in protecting and managing water resources and hosted an initial meeting to generate interest in the plan with many stakeholders representing a diverse range of interests in attendance. From municipal staff and conservation commissions, to state agency officials (e.g., NH Fish & Game, NHDES), to local residents and lake/pond/neighborhood associations (e.g., Milfoil Committee, Lees Pond Association, Suissevale, Balmoral), to land trusts and non-profits (e.g., Lakes Region Conservation Trust, Granite State Rural Water Association), to technical experts – LWA guided the creation of an Advisory Committee to ensure that a strong watershed restoration plan was developed for this important New Hampshire waterbody. This plan was partially funded by a Watershed Assistance Grant for High Quality Waters from NHDES using Clean Water Act Section 319 funds from the USEPA, with additional financial and in-kind services provided by the Town of Moultonborough, Moultonborough Conservation Commission, residents, and stakeholders. This comprehensive watershed plan will provide guidance for the next phase of actions needed to preserve the water quality of this picturesque waterbody. The water quality of MBI represents a core asset for the local economy as a premier tourist destination. This plan provides a roadmap for improving the water quality of MBI, and provides a mechanism for procuring funding to secure actions needed to achieve water quality goals. In addition, this plan sets the stage for ongoing dialogue among key stakeholders in many facets of the community, and promotes coordinated municipal land use changes to address stormwater runoff. The success of this plan is dependent on the concerted effort of volunteers, and a strong and diverse Advisory Committee that meets regularly to review progress and make any necessary adjustments to the plan. As part of the development of this plan, a build-out analysis, water quality and assimilative capacity analysis, and shoreline/watershed survey were conducted. Results of these efforts were used to run a land-use model, or Lake Loading Response Model (LLRM), that estimated the historical, current, and projected amount of phosphorus being delivered to the Inlet from the watershed. 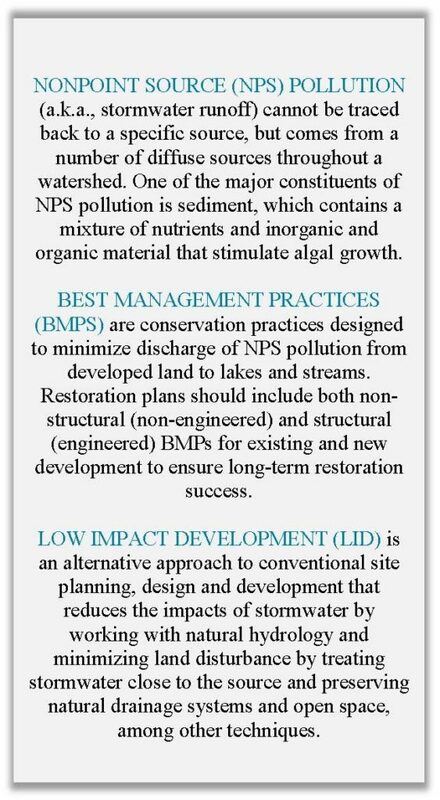 The MBI Watershed Restoration Plan includes nine key planning elements to address NONPOINT SOURCE (NPS) POLLUTION in impaired waters. These guidelines, set forth by the USEPA, highlight important steps in protecting water quality for waterbodies impacted by human activities, including specific recommendations for guiding future development, and strategies for reducing the cumulative impacts of NPS pollution on lake water quality. MBI represents a unique system for study because it is not a true lake, but rather part of a larger lake system, Lake Winnipesaukee, and thus, the Inlet itself is not listed as a separate assessment unit by NHDES, but is integrated with and classified the same (oligotrophic) as Lake Winnipesaukee, which is listed on the 2014 DRAFT NHDES 303(d) list as impaired for cyanobacteria. The morphology (shape) and bathymetry (depth) of MBI is irregular, causing the formation of individual basins, bays, or inlets within the study system that impact water and nutrient movement (flushing), and subsequently, system function and health. Given these characteristics of MBI, the Inlet was divided into three individual basins (Basin 1, 2, and 3) for modeling, data analysis, and goal setting purposes. One of the challenges posed by this division is the lack of consistent, long-term data for each of the three basins. The number of sites and frequency of sampling in MBI has varied over the 20-year period with more consistent sampling occurring in the last 5 years. Based on an oligotrophic classification, the assimilative capacity showed that Basin 1 is considered impaired for both total phosphorus (TP) and chlorophyll-a (Chl-a), requires the most reductions in TP compared to Basins 2 and 3, and is at risk for elevated nutrient input and algal blooms that could impact Basin 2 (and Basin 3 minimally). 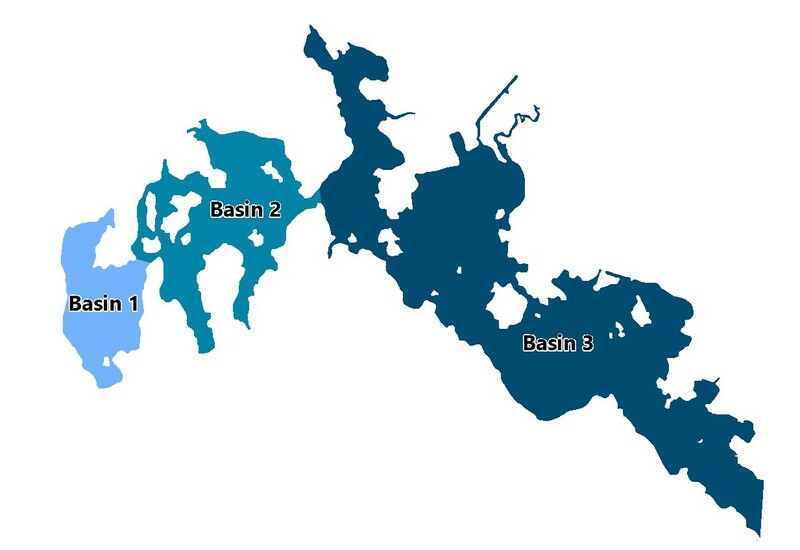 Basins 2 and 3 are potential non-supports due to insufficient, but likely lower than reserve capacity, Chl-a concentrations; minimal data from one site within Basin 2 and multiple sites within Basin 3 show that Chl-a is better than the criterion (3.3 ppb) and reserve capacity threshold (3.0 ppb) for oligotrophic systems. Until more Chl-a data are collected for Basin 2 and 3 sites, the water quality goal is based on the achievement of 7.2 ppb for TP with the understanding that this goal may change given the likely acceptable Chl-a levels in MBI. This plan provides short and long-term goals for improving the water quality of MBI over the next twenty years (2017-2036). The Advisory Committee has set adaptable interim water quality goals and milestones that will reduce current median in-lake total phosphorus to 7.2 ppb for Basins 1, 2, and 3, which would require a phosphorus loading reduction of 42% (26 kg/year) in Basin 1, 31% (27 kg/year) in Basin 2, and 20% (242 kg/year) in Basin 3. Refer to Sections 4 and 5 for more details on interim goals, milestones, and goal adaptation strategies for the three basins. 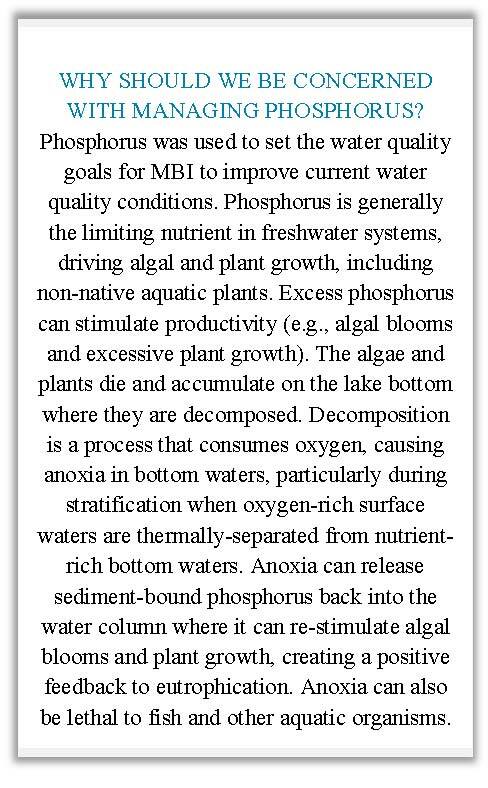 Achieving these goals will help reduce current in-lake phosphorus (and subsequently reduce the potential for anoxia and algal blooms) over time and help safeguard against increased phosphorus loading from the landscape as a result of development (e.g., septic systems, paved surfaces, sediment, etc.). Implement BEST MANAGEMENT PRACTICES (BMPS) throughout the watershed to reduce sediment and phosphorus runoff from existing development (Sections 3.4 and 4.2). Educate landowners through the NHDES Soak Up the Rain program, BMP demonstration sites, workshops, and other communication strategies, targeting high priority septic systems (>25 years old, within 50 feet of a waterbody, and rarely pumped out). Institute greater controls on new and redevelopment, require LOW-IMPACT DEVELOPMENT (LID) in site plans, and encourage regular septic system maintenance. Continue and/or expand the water quality monitoring and aquatic invasive plant control programs (Section 5.2.5). These objectives and more are discussed in greater detail in the Action Plan (Section 5.2). A. Identify Causes and Sources: Section 3.4 highlights known sources of NPS pollution in the MBI watershed and describes the results of the watershed and shoreline surveys. These sources of pollution must be controlled to achieve load reductions estimated in this plan, as discussed in item (B) below. B. Estimate Phosphorus Load Reductions Expected from Planned Management Measures described under (C) below: Section 4.3 describes how reductions in annual phosphorus loading to MBI may be realized over a twenty-year period, and describes the methods used to estimate phosphorus reductions. These reductions apply primarily to structural BMPs (e.g., installing vegetated buffers or rain gardens, mitigating runoff from roofs and driveways, improving and maintaining roads, and managing fertilizer) for existing development, but they will not be possible without the use of non-structural BMPs. Examples of non-structural practices include, but are not limited to, reviewing and improving zoning ordinances, promoting the use of LID designs for future development, and educating watershed citizens about activities to reduce phosphorus at home. C. Description of Management Measures: Section 5.2 identifies ways to achieve the estimated phosphorus load reduction and reach water quality targets. The Action Plan focuses on five major topic areas that address NPS pollution, including: septic systems, shoreline and watershed BMPs, roads, planning and land conservation, and water quality monitoring. Management options in the Action Plan focus on non-structural BMPs integral to the implementation of structural BMPs. D. Estimate of Technical and Financial Assistance: Sections 5.2 and 5.4 includes a description of the associated costs, sources of funding, and primary authorities responsible for implementation. Sources of funding need to be diverse, and should include state and federal granting agencies (USEPA and NHDES), local groups (watershed towns and lake associations), private donations, and landowner contributions for BMP implementation on private property. LWA and its core stakeholders, led by an Advisory committee, should oversee the planning effort by meeting regularly and efficiently coordinating resources to achieve the goals set forth in this plan. E. Information & Education & Outreach: Section 5.5 describes how the Education and Outreach component of the plan is already being or will be implemented to enhance public understanding of the project as a result of leadership from LWA and the Advisory Committee. F. Schedule for Addressing Phosphorus Reductions: Section 5.2 provides a list of strategies to reduce stormwater and phosphorus runoff to MBI. Each strategy, or “Action Item,” has a set schedule that defines when the action should begin. The schedule should be adjusted by the Advisory Committee on an annual basis (see Section 4.4 on Adaptive Management). G. Description of Interim Measureable Milestones: Sections 5.3 and 5.6 outline indicators of implementation success that should be tracked annually. Using indicators to measure progress makes the plan relevant and helps sustain the action items. The indicators are broken down into three different categories: Environmental, Programmatic, and Social Indicators. Environmental indicators are a direct measure of environmental conditions, such as improvement in water clarity or reduction in median in-lake phosphorus concentration. Programmatic indicators are indirect measures of restoration activities in the watershed, such as how much funding has been secured or how many BMPs have been installed. Social indicators measure change in social behavior over time, such as the number of new stakeholders on the Advisory Committee or number of new lake monitoring volunteers. H. Set of criteria: Section 5.3 can be used to determine whether loading reductions are being achieved over time, substantial progress is being made towards water quality objectives, and if not, criteria for determining whether this plan needs to be revised. I. Monitoring component: Section 5.2.5 describes the long-term water quality monitoring strategy for MBI, the results of which can be used to evaluate the effectiveness of implementation efforts over time as measured against the criteria in (H) above. The ultimate objective of this plan is to achieve a stable or improving trophic state. The success of this plan cannot be evaluated without ongoing monitoring and assessment and careful tracking of load reductions following successful BMP implementation projects. This plan was developed through the collaborative efforts of several Advisory Committee meetings and conference calls among FB Environmental and other technical staff, including LWA, DK Water Resource Consulting, and NHDES (see Acknowledgments). The Advisory Committee served to review water quality data and goals, identify priority BMP selections, and help tailor action plan items. On May 29, 2014, Pat Tarpey of LWA participated in the filming of the cable program “Talk of the Town” with Carter Terenzini, Town Administrator, and Bruce Woodruff, Town Planner, to promote the plan. On July 12, 2014, Bill Gassman of the Moultonborough Conservation Commission presented information on the plan to the Lees Pond Association; 25 people were in attendance. On October 27, 2014, FB Environmental, DK Water Resource Consulting, and LWA held a kick-off meeting to provide an overview of the watershed restoration plan development process, give interested stakeholders an introduction to the main purpose of the plan, and explain how the watershed towns and residents can use the plan to protect MBI. Attendees included the Moultonborough Town Planner, members of the Planning Board, Conservation Commission, Zoning Board of Adjustment, Milfoil Committee, and Heritage Commission, lakefront property owners, staff and students from Plymouth State University, and NHDES. On March 4, 2015, LWA hosted an initial Advisory Committee meeting with 15 stakeholders at the Moultonborough Town Library to generate interest in the plan. Stakeholders represented a diverse range of interests, including municipal staff and conservation commissions, state agency officials (e.g., NH Fish & Game, NHDES), residents and lake/pond/neighborhood associations (e.g., Milfoil Committee, Lees Pond Association, Suissevale, Balmoral), land trusts and non-profits (e.g., Lakes Region Conservation Trust, Granite State Rural Water Association), and technical experts. On August 4, 2015, LWA hosted a second Advisory Committee meeting with 10 attendees at the Moultonborough Town Library. LWA provided a summary of the tasks involved in the watershed planning process and results from the assimilative capacity analysis. FB Environmental presented preliminary results of the watershed nonpoint source survey and the Lake Loading Response Model (LLRM) for MBI. The objective of the meeting was to familiarize the Advisory Committee with the model results and get any feedback from stakeholders that would improve model assumptions. On April 12, 2016, LWA hosted a third Advisory Committee meeting with 15 attendees at the Moultonborough Fire Station. LWA and FB Environmental presented final results from the water quality analysis, assimilative capacity analysis, model results, shoreline and watershed surveys, and buildout analysis. Recommendations for the water quality goals were presented and discussed with stakeholders. Valuable concerns were mentioned and noted by technical staff for incorporation to the plan. On June 14, 2016, LWA hosted a fourth meeting at the Moultonborough Public Library with a subset of four Advisory Committee members to discuss plan development progress and to solicit feedback from stakeholders on the final water quality goals and potential action items. On August 13, 2016, LWA presented information on plan development and water quality of MBI at the Stanyon Pond Association Annual Meeting; 32 people in attendance. The action plan was sent to the Advisory Committee at the beginning of November 2016 for thorough review and input along with the draft watershed restoration plan. No formal public forum was held, but public comment on the action plan and draft plan was solicited following initial review by the Advisory Committee. On December 7, 2016, a fifth meeting of the Advisory Committee (11 attendees) was held to review the action plan and draft plan, as well as solicit input for the final selection of sites for BMP design. Comments and final BMP designs were incorporated into the final plan in December 2017. The final plan was presented at a public meeting held on December 11, 2017 at the Moultonborough Public Safety Building (40 attendees). Thank you all for your valuable input on this project!